(16/42) TRENTON – Due to continued pressures on northern diamondback terrapins in coastal areas of New Jersey, the Department of Environmental Protection has proposed regulations to close all harvesting of the species, Commissioner Bob Martin announced today. The rule proposal, which appears in today’s New Jersey Register, will close the harvest season for diamondback terrapins indefinitely. The proposal, which will be open to public comment and a public hearing, follows two partial season closures ordered by Commissioner Martin after the discovery of massive harvesting of terrapins to meet market demands, primarily in Asia. The diamondback terrapin is the only species of turtle that lives in the brackish waters of New Jersey’s coastal marshes and estuaries. It is slow to reach sexual maturity, and few of its offspring survive their first year due to predation from birds, animals and fish. Some of its biggest challenges have also been from people hitting them with cars as they cross roads, from habitat loss, drowning in crab traps, and from people who keep them as pets. In the past, commercial harvesting of terrapins was very limited, the season running from November 1 through March 31 and conducted by small numbers of harvesters using hand methods. But in 2013 one harvester took more than 3,500 terrapins from two locations in southern New Jersey, using a commercial crabbing dredge, and sold them to an aquaculture facility in Maryland. A joint investigation by the DEP’s Division of Fish and Wildlife and the U.S. Fish and Wildlife Service determined that this facility used the terrapins harvested in New Jersey to raise 14,000 terrapins for sale to overseas markets. The DEP’s Division of Fish and Wildlife has also been working with the New Jersey Marine Fisheries Council, as well as neighboring states, the U.S. Fish and Wildlife Service, and other terrapin experts to develop management strategies to enhance protection of diamondback terrapins in order to sustain the species in New Jersey. 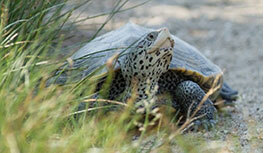 Although the diamondback terrapin has not been listed as threatened or endangered in New Jersey, it is considered a species of special concern. As part of the state’s recovery effort, the DEP will be assessing populations, ecological data, and habitat needs as it develops management strategies. They can be found in all types of coastal habitats, including the lower Hackensack River, Newark Bay, Raritan Bay, the numerous coastal estuaries along the Atlantic seaboard such as Barnegat Bay and Great Bay, and Delaware Bay and its extensive wetland areas. A public hearing on the proposal will be 6 p.m. Monday June 13 at the Stafford Township Municipal Building, 260 Bay Avenue, Manahawkin.